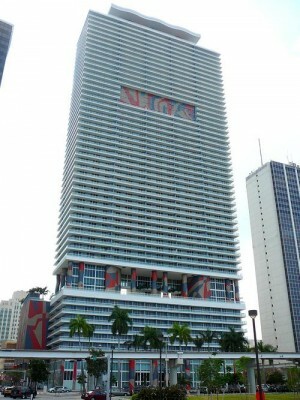 50 Biscayne is a fifty-five story skyscraper condo in the Central Business District of Downtown Miami, Florida. 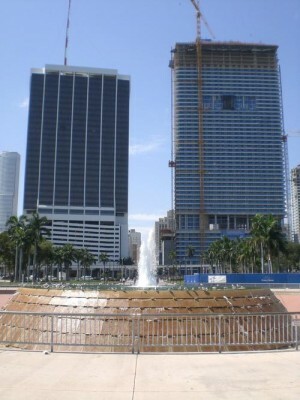 As its name implies, the tower is located at the address of 50 Biscayne Boulevard in between Flagler and Northeast 1st Streets. The size and stature of 50 Biscayne conceives a significant part of the Biscayne Wall, which is a series of buildings and parks stretching along the Biscayne Bay. The tower is 554 feet (169 m) tall and contains upscale commercial space at street level, such as the exclusive Mia at Biscayne entertainment venue. The tower's main lobby consists of three stories, followed by the Park Suites, which are condos customly furnished by the Rockwell Group, until the tenth floor. The tenth to thirteenth floors contain hotel-esque amenities available to the tower's residents. Ascending floors contain more condos and penthouses at the top two. The tower's architecture is based on the Miami Modern (abbreviated as MiMo) style, and has many design features that pay tribute to landscape architect Roberto Burle Marx's emphasis on natural aesthetics seen along the bay.